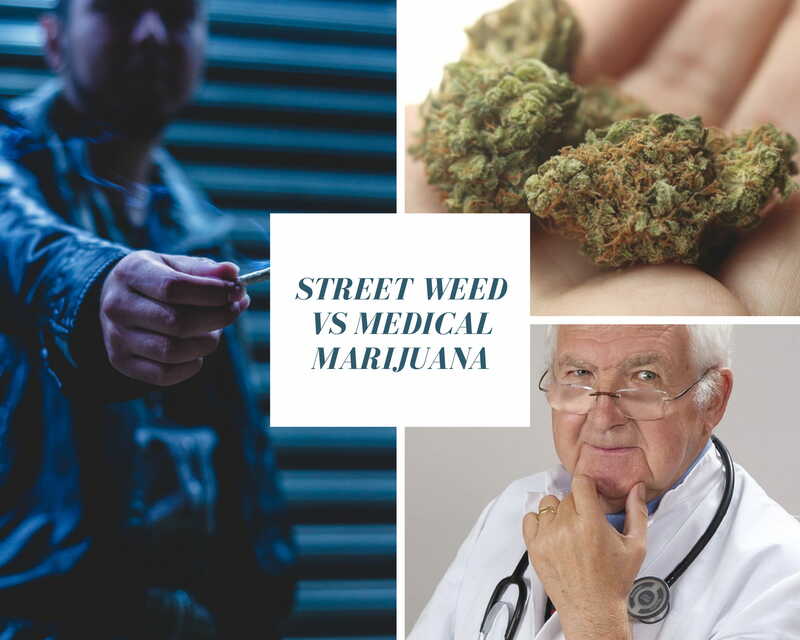 What’s the difference between street weed vs medical marijuana? The simple answer is quality control. But it is a little more complicated than that. Medical Marijuana is grown by state licensed facilities. In these facilities, the grow environment is controlled. Everything is tracked, from seed to sale. Any pesticides used are those recognized as safe for human consumption. Street weed is grown in an unknown environment. You may not know if the product is subjected to pesticides, or if the strains are separated. You have no say in the type of conditions subjected upon the plant unless you are growing it yourself. With street weed, you may or may not know what you are getting. You may have a hard time getting results due to the lack of consistency in the product. While you may have a great source that you trust, that source can disappear in an instant. Purchasing the product on the black market means that you have no way of knowing potency and CBD/THC levels. You may lose the desired Entourage Effect. You may not be able to buy different products for different times of the day. For instance, you may not have access to a high CBD/low THC product that allows for daytime activities. Medical marijuana purchased at a dispensary has gone through state regulated testing. Each product has the CBD/THC concentration listed on the packaging. The batch and harvest numbers are marked. You can work with the dispensary to find the products that work best for you. Many MM users find they prefer a different product depending on the situation or time of day. You may choose a higher CBD than THC ratio for daytime activities or outings. Break through pain or evenings can often call for a lower CBD, higher THC product. Products from the dispensary allow you more control over you own health. Medical Marijuana is legal under Florida law when following proper procedures. A MM patient must follow due process. This requires seeing a qualifying physician and then registering in the state’s database. They must buy the product from a licensed dispensary. Street weed, or marijuana purchased on the black market, is illegal under Florida law. Getting caught with a quantity of marijuana under 20 grams is a 1st degree misdemeanor. This can result in fines and up to one year in jail. The United States government recognizes marijuana as a Schedule 1 drug. It is illegal in all states and territories under federal law. You may have access to marijuana through a friend, or friend of a friend. Maybe you even dabble in a little recreational use. (This is a judgement free zone.) It all comes down to quality control and trust. Trusting the product and the supplier is a huge difference in street weed vs medical marijuana. That guy you know may be a great guy. He may have great product. But you will never truly know what you are getting and where it came from. Have I missed any other major differences? Please comment below if I have. ← Can I Qualify for Medical Marijuana in Florida?